Quilted Northern Ultra Soft And Strong Bath Tissue Only $0.20 Per Roll Shipped! You are here: Home / Great Deals / Amazon Deals / Quilted Northern Ultra Soft And Strong Bath Tissue Only $0.20 Per Roll Shipped! 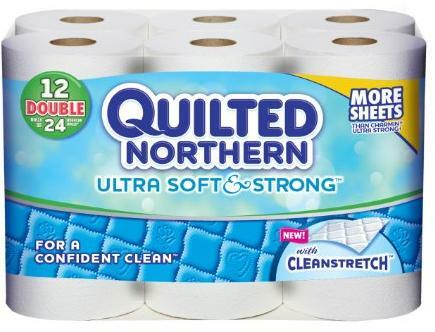 Quilted Northern Toilet Paper Only $0.20 Per Roll Shipped! Head over to Amazon where you can get Quilted Northern Ultra Soft and Strong Bath Tissue, 48 Double Rolls for only $21.24 (or $0.22 per single roll). Go here, clip the $1.50 off coupon in the center of the page and select Subscribe & Save on the right. And, if you subscribe to 5 or more items in one month, the price will drop even more to just $18.83 after coupon or $0.20 per regular roll shipped! Remember, that AFTER your item has shipped, you can cancel your Subscribe & Save order if you do not wish for it to ship automatically.